Pacific salmon are harvested in the Sahtú. These adult salmon are swimming up the Mackenzie River from the Arctic Ocean and are getting caught in subsistence nets set in late August to freeze-up in the Mackenzie River and also in Great Bear Lake. Although there is a historical record of Chum Salmon (also called dog salmon) harvest in the Sahtu, other species of salmon are now appearing, and the years when there are many salmon harvested are becoming more frequent. Due to these reports of changes to subsistence harvest patterns and the increase in Pacific salmon, Fisheries and Oceans Canada set up the Pacific Salmon Collection Program, which provides gift card rewards in exchange for subsistence harvested salmon. This program has been in place since 2000, and was expanded in 2011 to make it more convenient to trade in salmon. Many ENR offices, RRCs and the SRRB can now accept salmon and hand out gift card rewards. Karen Dunmall, an Arctic Fisheries Biologist at Fisheries and Oceans Canada, is collaborating with communities throughout the Canadian Arctic to study these salmon and identify what these changes in salmon abundance and distribution might indicate about the arctic ecosystem and how the presence of salmon may affect native fish species in the Mackenzie River and tributaries. All salmon used for this research are obtained from the subsistence fisheries throughout the Canadian Arctic. For more information about the salmon research project in the Canadian Arctic, please visit www.arcticsalmon.ca or www.facebook.com/arcticsalmon. 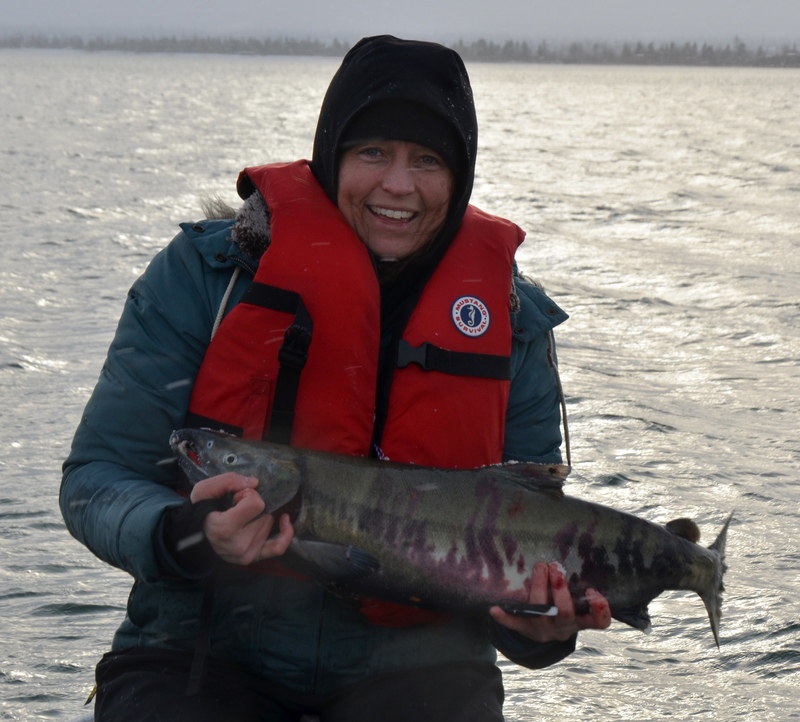 Karen posts on Facebook with progress updates, research findings, newspaper or radio interviews, where and when salmon are harvested in the Canadian Arctic, and what the research project is doing with the salmon that are traded in. Funding for this project is generously provided by Fisheries and Oceans Canada, the University of Manitoba, Government of Northwest Territories through the Northwest Territories Cumulative Impact Monitoring Program, Fisheries Joint Management Committee, Gwich’in Renewable Resources Board, Gwich’in Land Use Planning Board, the Sahtú Renewable Resources Board and a Liber Ero Postdoctoral Fellowship to Karen. Karen Dunmall with a chum salmon harvested in Great Bear Lake near Deline, NWT. This is the only live salmon Karen has touched in the Canadian Arctic because all of the salmon used for monitoring are provided from subsistence harvesters voluntarily trading in their fish to support this research.